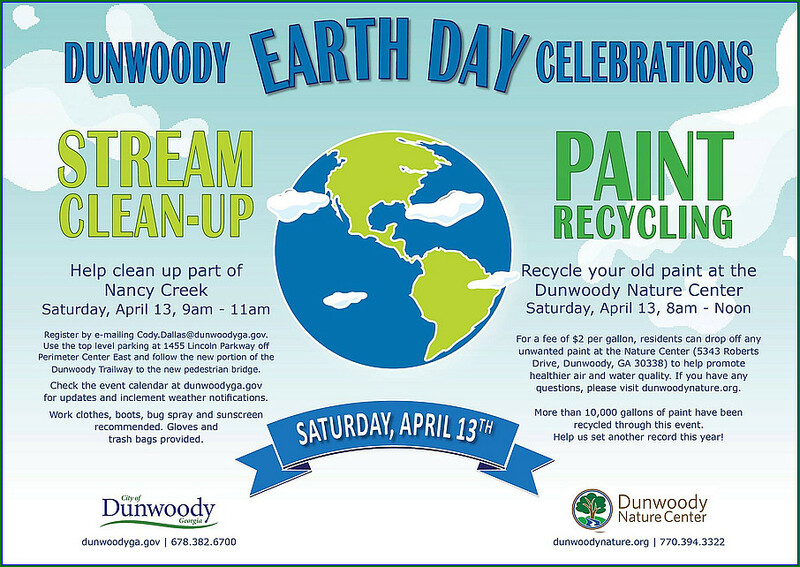 Heneghan’s Dunwoody Blog: Saturday - Earth Day Stream Clean Up in Dunwoody & Paint Recycling. Girl Scouts of Dunwoody North sub-divison also have a special project. Saturday - Earth Day Stream Clean Up in Dunwoody & Paint Recycling. Girl Scouts of Dunwoody North sub-divison also have a special project. Above is the official notice for Stream Clean Up for the City of Dunwoody taking place Saturday morning but the Dunwoody North subdivision Girl Scouts are also having a little side clean up project that I may be joining. For my neighbors in Dunwoody North looking to enjoy the afternoon and help the environment, please stop by to help the little ladies. "Hi friends and neighbors!! If you are free this Saturday, April 13, 2-3:30PM, please consider coming out to support Girl Scout Troop 16434 as they work to clean up Nancy Creek at the bottom of Vintage Lane. These sweet 3rd-grade girls have chosen this clean up as their way to make a difference in their community, and it would mean so much to them to see you guys there! "